Setting up a home cinema can get incredibly expensive, but it also bring with is endless wires to clutter up your lounge. The Z-5450 5.1 surround sound speakers from Logitech aim to reduce your wire count by operating its two rear speakers wirelessly. Before we continue, it's worth pointing out that although these rear speakers don't need to be hooked directly up to the Z-5450's Control Center, they do both require power and will therefore need to be situated near power sockets. Depending on the layout of your lounge, this might not be a problem. However, if there aren't any power sockets near where you want to place the speakers (the power cable on each speaker is just under 2.2m long), you'll need to use some form of extension lead. If you're planning to situate the rear speakers high on a wall, the power cable, which is markedly thicker than standard speaker cable, may well look unsightly as it trails down to the power socket. The rear speakers use a Wifi connection to talk to the Z-5450's Control Center. In order to avoid conflicts with nearby 802.11g networks, the Control Center will hop channels on the 2.4GHz band if it detects interference. It's recommended you keep the rear speakers and Control Center no further than 8.5m apart. We tested the speakers in a fairly cluttered wireless environment and suffered no signal problems. As for sound quality, the Z-5450's perform extremely well. Each speaker outputs around 40w, with the large subwoofer thumping out 116w of bass. The Control Center will decode Dolby Digital and DTS signals and will also upmix a standard stereo input. The remote is a little disappointing. Logitech has tried to keep it simple, but it's easy to accidentally jam the rubbery buttons under the casing. We also found it struggled to operate when used at a distance of more than 3.5m. 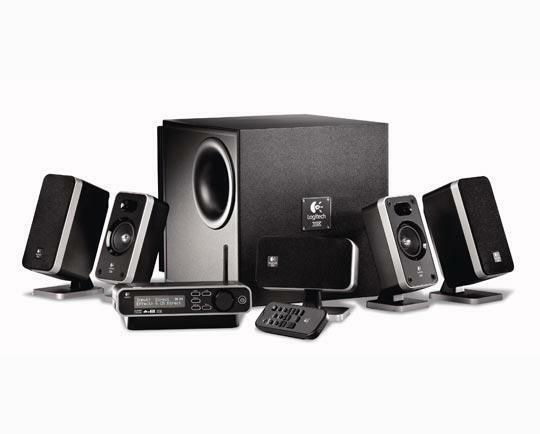 The RRP of $499.99 is a lot, especially when Logitech's standard wired Z-5500 system is more powerful yet $100 cheaper. However, at time of writing we found the Z-5450s on Amazon for an incredibly low $289.99. The rear wireless speakers won't suit all environments and many will be better off sticking with a standard wired surround sound system. But for those who have plugs in the right place, the Z-5450 is a quality set 5.1 of speakers that won't disappoint.